Introduction to Tableau for Data Visualization, February 11, 9 a.m.–10 a.m.
Introduction to the Pitt Data Catalog, February 12, 2 p.m.–3 p.m. File Naming Best Practices (coffee provided), February 14, 10 a.m.–10:30 a.m.
Data Drop-In Session (snacks provided), February 15, 8:30 a.m.–10:30 a.m. If you have shared your research data in the past, let us know what benefits or unforeseen outcomes you have experienced. Online submissions will have a chance to win a gift card. Positioned throughout the library will be interactive white boards to capture what issues you might have had with your research data including lost or corrupt files. Watch the HSLS newsfeed for more highlights of datasets that are included in the Pitt Data Catalog like Dr. Horn’s software and 3D models. Practical tips, resources, and stories will be shared via Twitter by librarians, data specialists, and researchers from all over the world. ….and as always, HSLS Data Services is available to offer support, consultations, and customized trainings on topics such as writing a data management plan (DMP) or organizing and describing your research data. 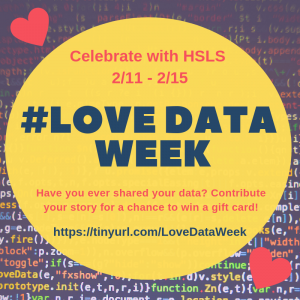 Stop in Falk Library to ask your question in person or e-mail us at HSLSDATA@pitt.edu.